I used to be very intimidated by smokey eyes because I didn't know if it would overwhelm my Asian features. Since I ususally wear pretty natural makeup, I made it a goal to conquer my smokey eye fears! After much experimentation, I found a technique I really like. * A GOOD, pigmented black matte shadow. 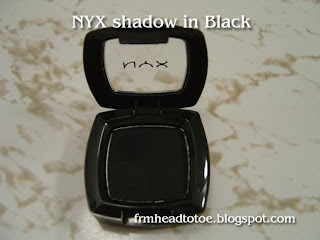 I used NYX Black single eyeshadow. Start off with a clean face. Apply your basic face makeup such as concealer, foundation, and blush. Apply UDPP or any shadow primer to your eyelids. Next, take your eyeliner and cover your entire lid under the crease. If you wear eyelid tape, cover all of the tape and a little bit above it too. It doesn't have to be perfect at this point since it's just a base. A black MAC paint pot works for this step too. Cover your entire lid under the brow bone with the purple shadow. Add shadow along the bottom lids too. Take the black shadow and apply it in a modified oval shape that goes up on the outer edges. 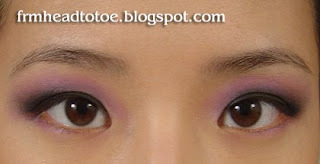 Blend the black shadow line into the eyeliner base and also blend the top into the purple. Next, add the Opal shadow as a highlighter under the brows. Add a touch of white shadow to the inner corner of your eyes and in the center of the highlighter color for an extra pop. Take your black pencil liner and line the bottom lash line tapered 3/4 of the way in. You can blend the line with a q-tip. 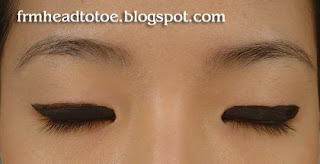 Also, fill in your brows with a dark grey shadow as it helps to frame the smokey shadow. Curl lashes and add mascara. I use Max Factor Waterproof Lash Perfection (for holding curl) for my top lashes and non-waterproof (no clumps) for my bottom lashes. 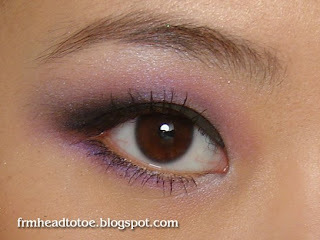 You can switch out the purple for any color, but this would be a great look for prom makeup or going out clubbing. Remember to keep your lips pink or neutral since you want to keep your face in balance. If you have strong eyes, go easy on the lips and if you are doing bright red lips, keep a natural eye. I also love wearing a grey or light hazel lens with this look since it really brings out the colors. If you try it, send me pictures because I'd love to see your results. Good luck! this has to be my favorite smokey eye'd tutorial..i'll definitely have to give it a try after finals. Are your eyebrows naturally soft/light in color or do you have to bleach it? It doesn't look that dark/black, which is nice. what a simple and pretty smokey. love your updates! keep it up. Anonymous: My eyebrows are naturally...medium. I have full brows but they aren't thick so I have uneven spots that I fill in with shadow. I used a charcoal colored shadow instead of a straight black because I didn't want them to be too harsh. I hate eyebrow pencils! When I wear brown shadows I sometimes use a dark brown on my brows instead, which also gives a softer look without having to bleach. god, i love your tutorials. everything always seems so effortless ! this is my favorite smokey eye tutorial i have seen so far. i think i'll use it for my formal (which is like prom for you). oh wow! that look is totally gorgeous, I'm BLOWN away! This looks like a smokey eye look I can actually do, coz usually I just look bashed if I try lol. This is just a thought, but I was thinking that maybe you could just make posts with FOTDs, since tutorials take so much effort, but FOTDs are fun + easy, and we can see some different color combinations/styles hehe. Gorgeous, I gotta try that sometime! I'm just always way too cautious about making that exaggerated black panda-eye! I'll be more brave next time hah. This is a pretty smokey eye! I have monolids and all my smokey eye attempts look like I've been punched, but I think I'll try this one. I noticed that you have eyelid tape on for this tutorial; do you think it'll turn out as good without the tape? lilsweetkaz: I've actually been considering that too, but I at least wanted to do a smokey eye tut since it seems to be more difficult for people. I'll post up fotd's in the future. Thanks! poohpooh57: I'll try to do more vids in the future! Fiona: It might take a teeny bit of tweaking, just make sure that the part of your monolid that folds under (if yours does) is all black and when you open your eyes it looks like my pics when my eyes are open. 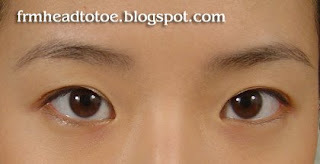 It's like doing thicker eyeliner on monolids...even if you can't see the thick line, others will when you blink. Definitely give it a try and I'd love to see your results! oooh pretty! we should do this for a shoot. wow. it's amazing what double eyelids and color contacts can do! where did you buy the eyelid tape? where can i find it? thanks! lol i tried it for a graduation party over the weekend and i looked hideous! i seriously dont know how to put on makeup and i cant pull it off-the dramatic makeup look. your pictures always turn out so nice! I was wondering what digital camera you use? connie: if your dark shadow falls on your bottom lids or cheeks, try dusting loose translucent powder below your eyes and on your cheeks before you put on the shadow. when you are done with your eye makeup, use a clean brush to brush the loose powder away so your face is clean. anonymous: I bought my tape from a local asian beauty supply store but you can also buy it online. very pretty purple smokey eye! :D you did a really good job with this! You have saved my life - I am wearing a purple dress to a wedding and this step by step was great, thank you! Hey, I had a question. 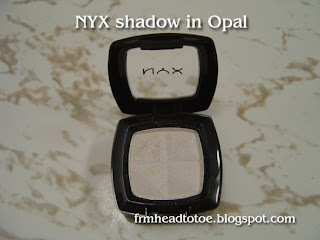 For the smudgey black liner in the beginning, can you use NYX jumbo eye pencil in black bean? I have another question, can I actually use the Blacktrack fluidline from MAC instead?? thanks gal! will giv it a try! I'm dying to know what coloured contacts you're wearing in the second last picture! Thanks Jen, your site is amazing! Hi Jen! Same question as above actually, which pair are those? the contacts in the second to last picture really compliments the finished look, and super natural as well! 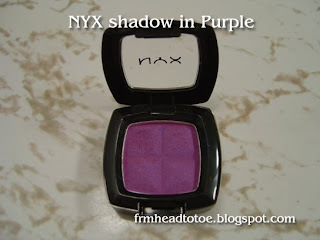 so, for the picture you had on your blog with the black smokey eyeshadow, what colors did you use instead of the purple?? thanks!! i love this look! what are your lenses on the last couple of pictures :O ?